Micheál wrote: Dropped into Eagle last night. Saturday night, 10:45 p.m., 6 customers! They must be all in the Igoe in Ballybrack...it is throbbing every night...and at the prices...Killiney Castle ...hard to get a seat...sitting in the gardens there on these balmy evenings makes the drink taste soooo goood. Don't know what the Craig is (or lack of)with the eagle I haven't been there in years I think in the days of evening funeral removals to the church was the last time I was there,last I heard the pub was franchised out which never really works well in my opinion as these guys will serve allsorts to get their money usually driving out the regulars.sad to see so few in the pub on a Saturday night it was a great pub once. Gosh that is great skins. I love the photo. Over the years I had the pleasure of great chats with the author. Glasthule now has a public access Defribulator. It is on the side wall of Sam Macauleys Chemist. Can't put up a photo as the limit has been exceeded. Yes Holla, it is a great tribute to the late Larry Costello. The family are tireless in getting funds together. The things you come across rummaging through old papers. And we always assumed Black '47 was something experienced in the west. Great article Micheál. It must have been a terrible time for all crop growers. 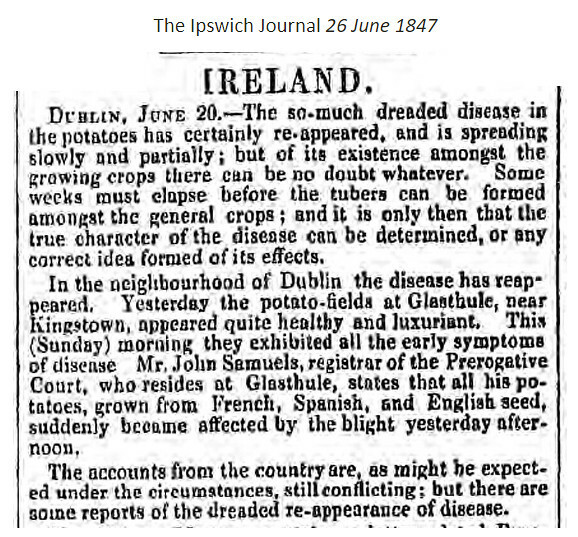 Interesting that there were potato- fields at Glasthule. I suppose all the land was used for crops with no supermarkets!! We have got very far removed from the land in this generation. Though if potatoes keep going up in price I might consider putting in a few on Patrick's Day. I remember my father gathering the good ones and cutting them in sections when the eyes formed then on with the coats and dig the trenches!! ( the children picked the stones and cleared the plots!). Now you have me back thinking about the famine times! Conductor David Brophy and the Glasthule Opera Orchestra return with the eagerly-awaited annual Opera Gala showcasing a host of Ireland's next generation of Opera Stars. Enjoy an evening of favourite and famous arias and ensembles from the great opera composers - Mozart, Puccini, Verdi and lots more. Rocker, what is the venue? Sorry Sinead...should have said Pavilion Theatre.